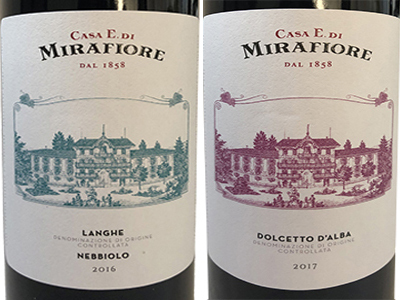 The 'Piedmont Fine Wines' Tasting by Casa E. di Mirafiore is a limited edition gift box containing 2 bottles with historical label (1 Langhe DOC Nebbiolo 750 ml + 1 Dolcetto d'Alba DOC 750ml + 1 vintage Mirafiore poster + 1 Mirafiore corkscrew). Two prestigious historical wines that transport to the roots of Piedmont. 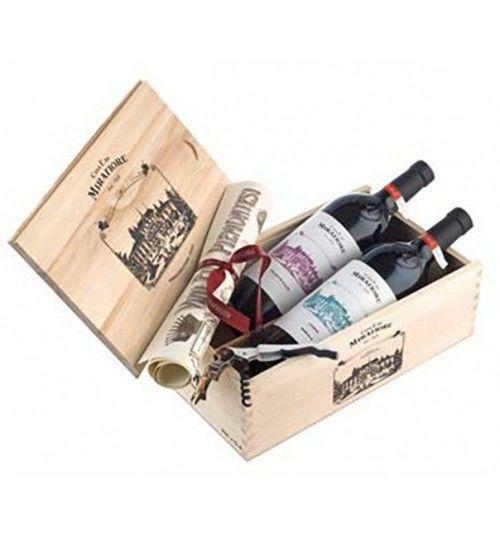 THE WINE The ' Piedmont Fine Wines ' Tasting by Casa E. di Mirafiore is a limited edition gift box containing 2 bottles with historical label ( 1 Langhe DOC Nebbiolo 750 ml + 1 Dolcetto d'Alba DOC 750ml + 1 vintage Mirafiore poster + 1 Mirafiore corkscrew ). Two prestigious historical wines that transport to the roots of Piedmont. THE COMPANY That of the brand known as Mirafiore is one of the most fascinating and troubled stories of the Langhe. It all started in 1858, when with a "act of command of the delegated royal" the municipality of Serralunga d'Alba was registered at the Fund of the Real House a lot of 52 hectares located in the heart of the Langhe, between Sorano, Fontanafredda and Gallareto. A cellar that then bears the name of its founder - the Count of Mirafiore, Emanuele Guerrieri, son of Vittorio Emanuele II and the famous Bela Rosin - and who enjoyed an extraordinary success at least until the beginning of the First World War. Later, around the year 1930, a bad management, combined with the arrival of phylloxera, led to its failure. At the next auction, the Monte dei Paschi di Siena bank took over the Fontanafredda estate, while the Mirafiore brand was bought by the Gancia di Canelli family. And so, a few years later, the Fontanafredda brand was born, a reality that took its name from the place where it was based, and that in the following decades would literally have made the history of modern Barolo. A period during which we tried in different ways to reacquire the original brand, but without succeeding. It is only recently, more precisely in 2009 thanks to the intervention of the patron of Eataly Oscar Farinetti, who has finally managed to revive what was one of the great wines of Barolo and more specifically of Serralunga d'Alba. A line of the highest quality, made of great attention both in the vineyard and in the cellar, where every practice combines the Langhe tradition with the most contemporary winemaking techniques. The wines, Dolcetto, Barbera and Nebbiolo, up to the great Barolo, are all characterized by a strong elegance, excellent demonstration of a company perfectly in line with the times, which can look at the next harvest with great confidence. Alcohol Content 14% vol., 14,5% vol. Size 2 x 750 ml. Tasting Color: garnet red with ruby reflections. Bouquet: notes reminiscent of nutmeg, dried tobacco leaves, black plum and tamarind. Taste: sweet and enveloping tannic impact, decidedly long balsamic finish. That of the brand known as Mirafiore is one of the most fascinating and troubled stories of the Langhe. It all started in 1858, when with a "act of command of the delegated royal" the municipality of Serralunga d'Alba was registered at the Fund of the Real House a lot of 52 hectares located in the heart of the Langhe, between Sorano, Fontanafredda and Gallareto. A cellar that then bears the name of its founder - the Count of Mirafiore, Emanuele Guerrieri, son of Vittorio Emanuele II and the famous Bela Rosin - and who enjoyed an extraordinary success at least until the beginning of the First World War. Later, around the year 1930, a bad management, combined with the arrival of phylloxera, led to its failure. At the next auction, the Monte dei Paschi di Siena bank took over the Fontanafredda estate, while the Mirafiore brand was bought by the Gancia di Canelli family. And so, a few years later, the Fontanafredda brand was born, a reality that took its name from the place where it was based, and that in the following decades would literally have made the history of modern Barolo. A period during which we tried in different ways to reacquire the original brand, but without succeeding. It is only recently, more precisely in 2009 thanks to the intervention of the patron of Eataly Oscar Farinetti, who has finally managed to revive what was one of the great wines of Barolo and more specifically of Serralunga d'Alba. A line of the highest quality, made of great attention both in the vineyard and in the cellar, where every practice combines the Langhe tradition with the most contemporary winemaking techniques. The wines, Dolcetto, Barbera and Nebbiolo, up to the great Barolo, are all characterized by a strong elegance, excellent demonstration of a company perfectly in line with the times, which can look at the next harvest with great confidence.